The crew of the first manned Apollo space mission inside the White Room. 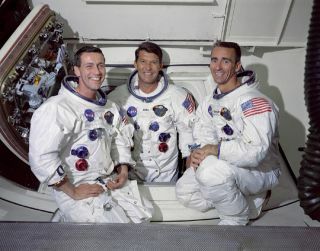 In this historical photo from the U.S. space agency from May 22, 1968, the prime crew of the first manned Apollo space mission is pictured from left to right: Command Module pilot, Don F. Eisele, Commander, Walter M. Schirra Jr. and Lunar Module pilot, Walter Cunningham. The photograph was taken inside the White Room which is attached to the crew access arm. From here astronauts ingress and egress the spacecraft. Commander Wally Schirra Jr. is seen inside the opening of the Command Module's main hatch.